The journey continues to Burgundy, with visits to Domaine R. Dubois & Fils, Domaine Guy & Yvan Dufouleur, and Justin Girardin. Snow threatened, Frank took care of his Andouillette fix, and all things said a solid day at the office. Conditions in Burgundy for the 2018 vintage were similar to Alsace, and the whole Northern part of France for that matter. The result is a large crop (sometimes too large) of concentrated wines with saturated colors. People who started their harvesting on time and did not overcrop will have superb reds and very good whites. Given the weather, it is more of a Red vintage than a white as acidities may be low. Domaine Guy & Yvan Dufouleur 2018 H.C. Nuits, dark, loaded with fruit. Domaine Guy & Yvan Dufouleur 2007 NSG Poulettes mature, or close to it, beautiful aromatics, ordered everything available. The wines are less concentrated here, which is their style, but in 2018 this is actually an advantage. Here we have a traditional estate in Premeaux, near Nuits-Saint-Georges, not unlike Dufouleur, but a little more old-school with something of an “undiscovered” feel to it. Frank has worked with this property for years on the Poot Agenturen side of things in Europe. We talk a lot about colors here, because at Dubois they are sometimes on the light side. Wonder why? Well, in these modern times enzyme additions to Pinot Noir at crush have become the norm even in traditional ole Burgundy and while we don’t have a huge problem with this it is refreshing to work with someone like Dubois who is traditional to the max and proud of the naturally light color you end up with in the finished wines of this region.. We should do more with them – Prices are good, few old school estates like this exist anymore, and they offer a wide range of wines. We tasted 2018’s with Justin out of barrel at his main space in Santenay. One thing you instantly notice about Justin is that he is an intensely focused person. This was actually the winery of Justin’s famous uncle Vincent Girardin, until Vincent moved his operations a few kilometers North. 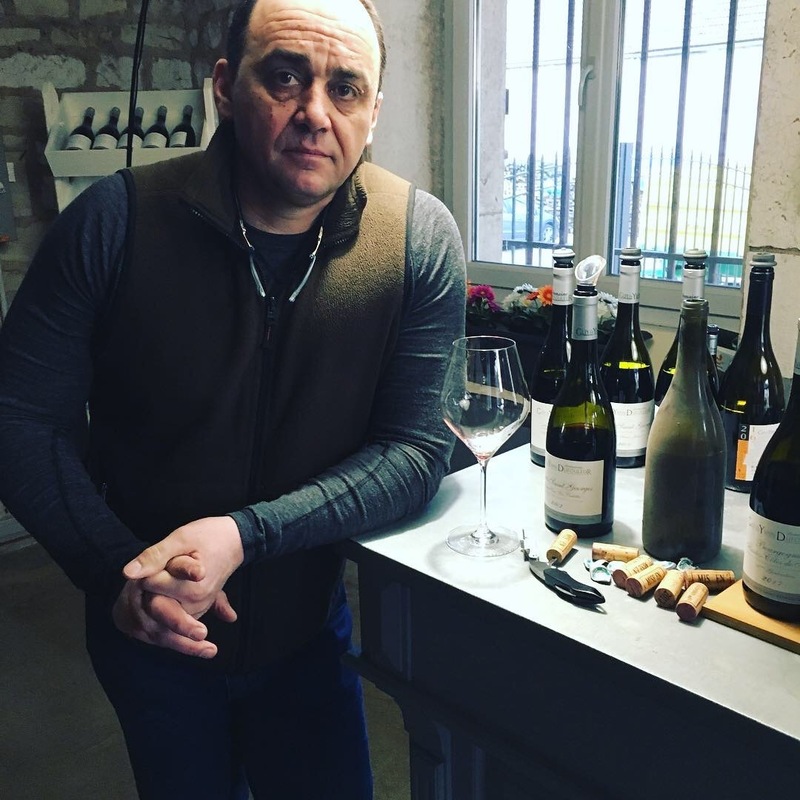 It is worth noting (some of you already know this we are sure) that Vincent Girardin recently sold his Domaine to Boisset, and the way we see it this puts young Justin Girardin in the position to carry the storied torch of this overachieving Santenay based family. Carrying that torch well he is. Just for the sheer pleasure of it we want to drive back and taste this whole lineup once more! Justin Girardin 2018 Santenay, beautiful lemon color, long, fine, outstanding for appellation. Justin Girardin 2018 Chassagne Montrachet Morgeot, citrusy, rich, very good. Overall a stunning set of wines, as good as it gets. While there aren’t huge quantities made of any of these wines there is enough production of the Bourgogne Blanc and Rouge for us to give them focus and build volume. 2017’s are still available in decent quantities. Lesser 2018’s will be bottled in the summer. At this point we were able to get the virtual reality camera working so check out the embedded image of Justin in his cellar below and move the view around. Preferably just put on a VR headset. Depending on when you are reading this you “should” be able to walk around the winery that way but we are messing with some image stitching issues at the moment…stay tuned! That’s it for now, onwards towards the Macon!